Research has shown that Biotin helps with healthy hair growth. 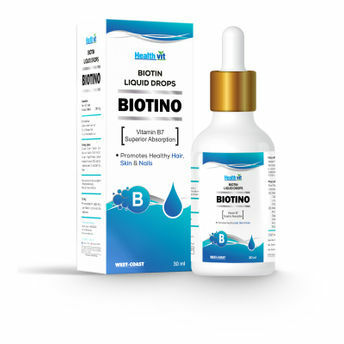 At 5000 mcg of Biotin (plus other key vitamins and essential oils), Healthvit Biotin Drops will help aide in growing healthier, stronger, thicker hair. The liquid form increases the absorption & efficiency levels giving you the best chance of positively affecting the overall health and beauty of your hair. About the Brand: HealthVit is a Herbo-Nutra (Herbal & Nutraceuticals) segment of Ahmedabad based MNC West-Coast Pharmaceuticals delivering a wide range of quality healthcare products since last 46 years such as Dietary and Nutritional supplements, Medicinal Products and various Skincare Products helping you lead a fit and healthy lifestyle.Their motto is very simple: purest ingredients, stringent processes and high quality guaranteed!